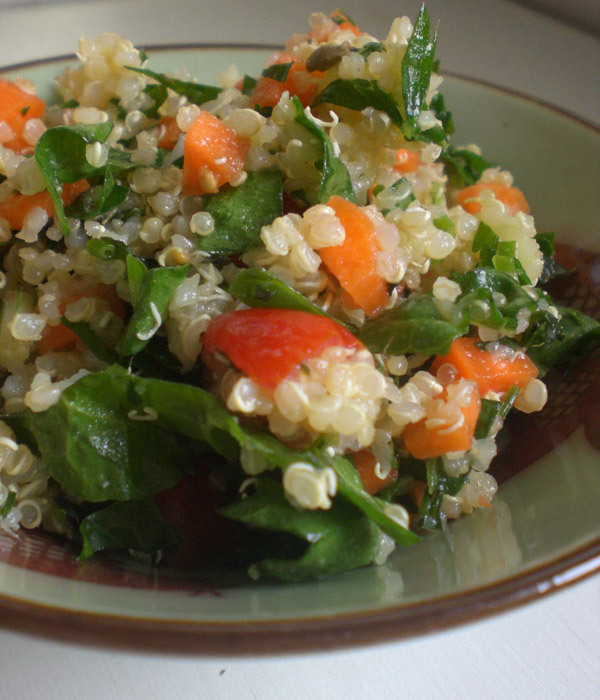 Chard and Quinoa Salad | A Bushel of What? A week ago, I decided I'd like to make some Tebbouleh. We picked up a bunch of mint and flat leaf parsley from the grocery store, and my plan was to make enough salad to last me for the week as a side for dinner or as a snack during the day. Did that happen? No. It took me exactly eight days from when I purchased the herbs to actually have the time to make the salad. By that point, I had my greens from the farm in the fridge and I knew it was time to dive in to the stash. Luckily, the herbs were still fresh! My inspiration for this salad is a Tebbouleh recipe by Ina Garten that I found on Food Network.com. Instead of the traditional bulghur, I used quinoa. The addition of chard and carrots punched up the dish in color, crunch, and nutrition! The mint and parsley provide a refreshing flavor, and the tartness of the lemon is subtle and delicious. I recommend letting this dish sit for a day to allow the flavors to meld, but it won't be the end of the world if you eat it right away. The next time I make this salad, I hope that the mint, parsley and other vegetables will come from either my own garden or the farm, and not the grocery store! In medium saucepan, bring water and quinoa to a boil. Lower heat, cover, and simmer until quinoa absorbs all liquid. Transfer quinoa to a large bowl and add lemon juice, olive oil, and salt. Stir to combine and cover bowl. While preparing the rest of the ingredients, let the quinoa cool and absorb the flavors. Once the quinoa is at room temperature, add the remainder of the ingredients and combine. Season with pepper. If possible, refrigerate over night. And don't forget to put those chard stems to good use! mmmm can't wait to try this, my pickup is Monday! love tabbouleh and quinoa, so this is perfect. and congratulations on your new baby... so great to enjoy the summer with a tiny one. This looks delicious! LOVE the blog, Nic! Fantastic idea to use the quinoa, which I plan to lift straight from this blog and into my own receipe file! Your blog is amazing! This is my first week ever as a CSA member. I made your quinoa recipe last night because I had all the right ingredients, down to the chives and the chard. It is great to get recipe advice from a CSA member living in my own area (MA/RI) because it means the ingredients overlap so nicely. We also tried the veggie dumplings - divine. Any suggestions for what to do with the leftover stuffing? I am amazed that I went through all those greens in a week. Thanks for your creative work on this! Mmmm, this looks wonderful. This may be a good way to get my husband to eat quinoa too! 2010 CSA Season Has Begun!